Christmas is the feast of encounter, the celebration of God’s love and nearness. “The Word became flesh and dwelt among us, full of grace and truth,” we read in St. John’s Gospel. God became one of us! He united himself to every man, woman and child in every time and place in Jesus Christ, the sacrament of our encounter with God. Jesus’ coming among us in the incarnation is the ultimate encounter, but the Gospels also present the nativity as a time full of meaningful human encounters. The first to meet the newborn infant and his parents were the shepherds. They represent the simple and lowly of this world who are receptive to the Good News because they recognize their poverty and their need for God. The Magi who came from the East represent those with wealth, social standing or fame. But the Magi, too, were inwardly seized by God and possessed the humility born of faith, which gave them the courage to leave all and undertake a long and arduous journey into the unknown. The Christmas season traditionally comes to a close with the feast of Jesus’ Presentation in the Temple, the day when Mary and Joseph brought their Son to the temple for the first time, where they were greeted by the elderly prophets Simeon and Anna. For me these two figures have always symbolized the countless elderly residents of our homes, who live far from the public eye but who lift up the world with their sincere, faith-filled prayers. Unfortunately many contemporary Simeons and Annas will spend this Christmas alone. In some cases they have outlived their loved ones, while in others they have essentially been forgotten by children and grandchildren who are all too caught up in the material pursuits that have come to define the Christmas season in our culture. The irony is that not only do the elderly deserve our attention and care, but spending time with them would enrich us with the gifts that really matter – unconditional love, wisdom, patience and kindness. I would like to suggest that this Christmas we focus more on “presence” than “presents,” especially in our relationships with the elderly. Whether we consider ourselves poor shepherds or kings of privilege, we have something to give, and much to receive, from our encounters with the elderly. — Offer to help an elderly relative or neighbor decorate for Christmas, or offer to drive them to church for all the important celebrations of the holiday season. — Bring a home-cooked meal to an elderly relative or neighbor and take the time to enjoy it with them. Even better, give them the “homemade dinner of the month club” for the coming year. — Similarly, give an older person the “movie of the month club” by joining them at home once a month for one of their favorite old movies. If your older friend or relative lives in a senior care facility, offer to sponsor a monthly movie night for a group of residents. — Offer to complete some much-needed home repairs for an elderly loved one or neighbor. — Ask an older person to teach you how to knit, crochet, bake or play their favorite card game. Giving them the opportunity to share their experience and expertise will bring them much joy. — Help a grandparent compile family photos into an album, photo book or video that could be shared with the whole family as a Christmas gift. You would be helping to create a precious family heirloom. The point of all these suggestions is to give the gift of your “presence” rather than “presents” – to nurture a spirituality of encounter between the generations by reaching out to the elders in your midst. In doing so, you will make love incarnate in your midst, and that is what Christmas is all about! 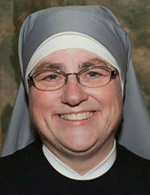 Sister Constance Veit, l.s.p., is director of communications for the Little Sisters of the Poor.